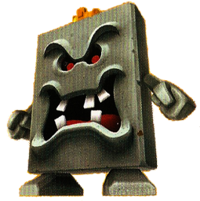 Whomp King, also known as the Giant Whomp, is a character in the Mario franchise. He is the king of all the Whomps. The Whomp King's first appearance was in Super Mario 64 as the boss of the Whomp's Fortress, and presumably is a member of the Koopa Troop. When he appears, he states that he is angry about how people treat rocks, and seems to want retribution. The Whomp King debuts in Super Mario 64. When he is confronted on top of Whomp's Fortress in Super Mario 64, he makes a short speech, then engages Mario in battle. Like most Whomps, he attacks by falling face-first in an attempt to crush the player. While he is flat on the ground, the player must Ground Pound his back three times to defeat him, causing him to release a Power Star. For some reason, if the player wall kicks into the Whomp King and jumps away from him before the fight, Whomp King talks to the player and initiate the fight as soon as they land. However, the battle ends seconds later, since Mario is not allowed to move very far from a boss he is fighting with. In the remake, Super Mario 64 DS, the Whomp King has undergone slight changes in his appearance. He now wears a golden crown which distinguishes him easily from the other Whomps, and his arms and feet look more like they are made of rock. Unlike in the original Super Mario 64, he can no longer be defeated via a glitch which allows the player to jump right through his body and then Ground Pound him easily. Otherwise, his role is essentially the same as in Super Mario 64. The Pattans that aid Whomp King during battle in Super Mario Galaxy 2. In Super Mario Galaxy 2, the Whomp King reappears as the boss of Throwback Galaxy, which is a remake of Whomp's Fortress. However, how he is encountered is slightly different from how he was in Super Mario 64. At the top of the fortress, a Whomp is found instead of the Whomp King. After it is defeated, the entrance door on the ground (emblazoned with Bowser's emblem on it) opens to reveal a pathway to the Whomp King, who is fought on the underside of the fortress. The sky turns dark and stormy when the Whomp King appears. His fight is similar to his debut fight in Super Mario 64, and he also quotes, nearly word-for-word, his original speeches from the aforementioned game. In addition to being much larger than before, and having a smaller area that Mario must Ground Pound to damage him, he also has a few new abilities. When he attempts to crush Mario, the attack creates a shockwave when he hits the ground, which paralyzes Mario for a brief moment if he doesn't jump at the correct time. Like with other such obstacles, if the Whomp King manages to crush Mario, he loses a life instantly, regardless of how many wedges of health he has left. He can also stomp his foot to produce several miniature Whomps called Pattans that chase after Mario, and can jump to stun him as well. If the player loses a life while fighting Whomp King, he starts to give the same speech before the second attempt only to interrupt himself in the middle, saying "-- Arrrgh! I'm tired of this speech!". Whomp King shares his battle music with Digga-Leg. The Prima guide suggests that the Whomp King is genderless (using "it" rather than "him"), even though the fact that he is a king would suggest that he is male. [page number needed] Excluding Bowser and Bowser Jr., Whomp King is the only boss in the game to have dialogue. In this game, his face changes when he is defeated. However, since he is facing the ground during this point, the different face cannot be seen in normal gameplay. Whomp King appears in Mario Party 3, in the Creepy Cavern. He is lying on the road, and to make him move out of the way, the player needs to give up an item. Although Whomp King does not physically appear in Mario Golf: Toadstool Tour, Mario Golf: Advance Tour, or Mario Golf: World Tour, his name sometimes appears on the tournament scoreboard. ↑ (February 24, 1998). Giant Whomp - (Course 2). Nintendo: Super Mario 64 Strategy (Internet Archive: Wayback Machine). Retrieved February 23, 2018. This page was last edited on December 15, 2018, at 22:49.